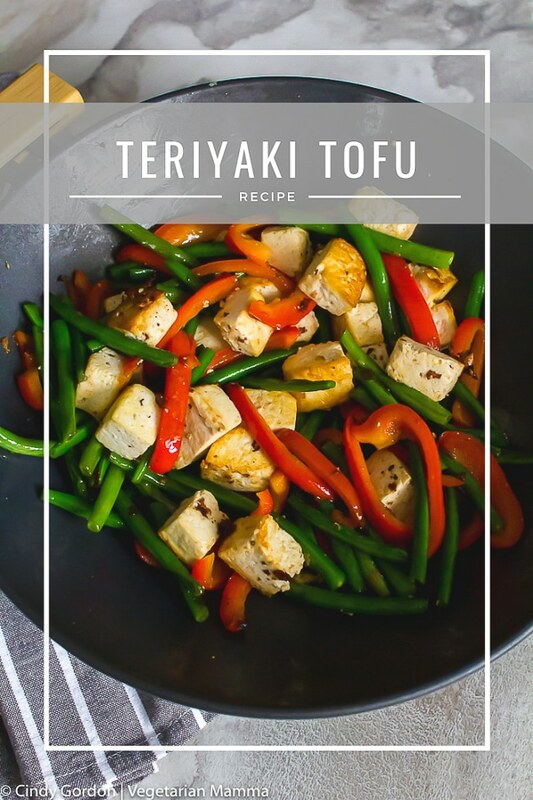 Teriyaki tofu stir fry is a mouthwatering vegan tofu recipe that the entire family will love! 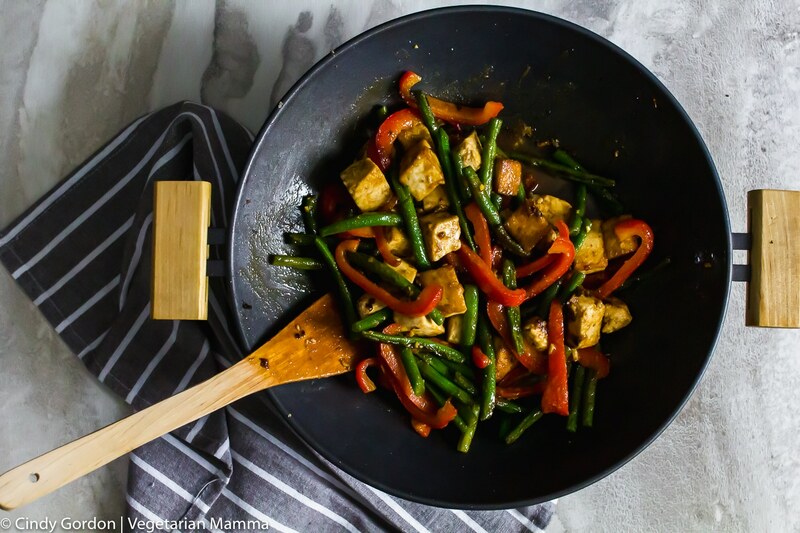 If you are looking for tofu dinner recipes, this vegan tofu stir fry is perfect! 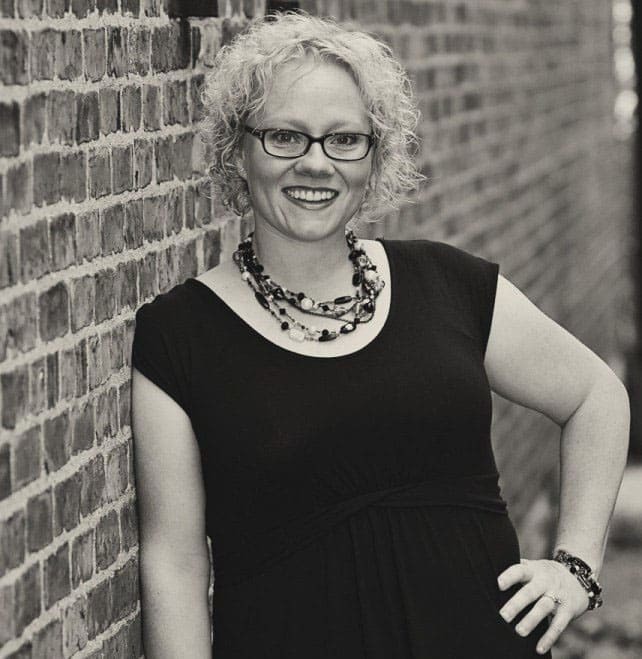 Thank you to the EZ Tofu Press for sponsoring this post. There is just something about stir fry recipes that make me so happy. 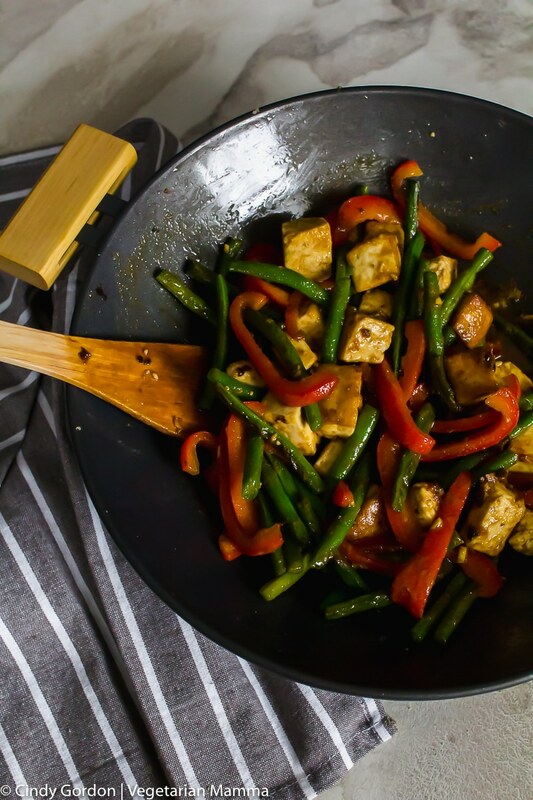 I think because these vegan tofu stir fry recipes are always delicious. Honestly, they never seem to fail. They never let me down! This particular teriyaki tofu recipe cooks up so quickly! We are always taking meals up a notch with our tofu dinner recipes! If you love tofu, you might also love our Brown Sugar and Balsamic Tofu, our Air Fryer Tofu and our Sheet Pan Lemon Tofu. So just for fun, I looked up the meaning of teriyaki. Basically, I learned that Teriyaki is a cooking technique that is used when making Japanese cuisine. 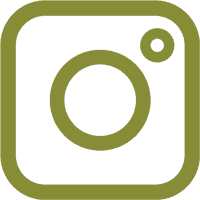 In North America, we tend to call any dish made with teriyaki-like sauce actual “teriyaki.” Teriyaki sauce typically has a sweetness that adds tremendous flavor to any protein that it is added to. The method of stir fry cooking started in China. Basically, the method is cooking small amounts of food, in very hot oil in a wok. 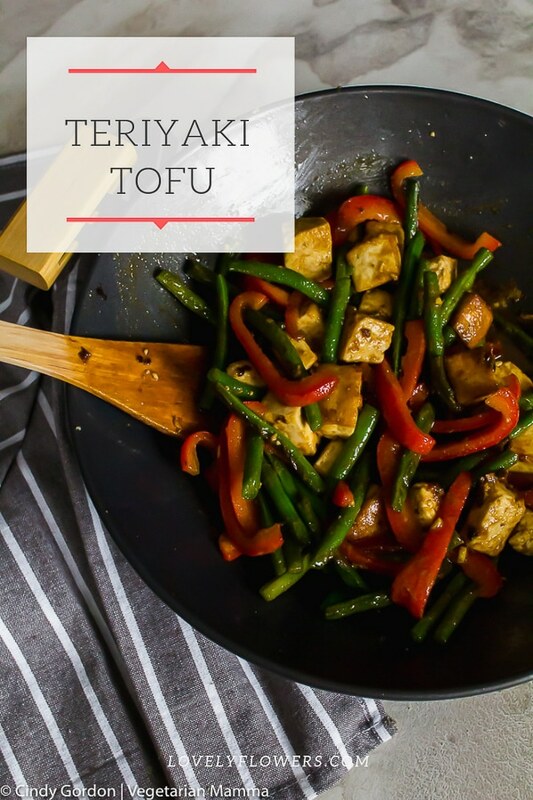 So this teriyaki tofu recipe, combines some Japanese and Chinese history with the flavors and the method of cooking! If you’re going to be cooking with tofu, then you. need an EZ Tofu Press! Tofu holds water and you need to be able to get that water out so that it firms and cooks without being soggy! All you need is the EZ Tofu Press, and you’ll be well on your way to cooking and eating tofu in no time at all. 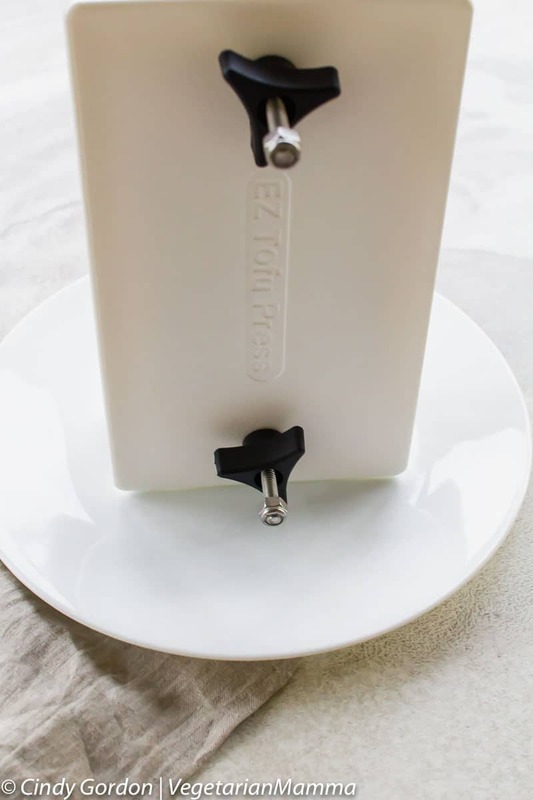 The EZ Tofu Press (affiliate ad link) takes the liquid out of your firm or extra firm tofu easily and quickly. Seriously, this machine does all the hard work for you! It is very simple, you are going to first press your tofu. Then whip up your sauce. Dice your vegetables. Wok fry/cook your tofu and veggies and top with sauce! Easy peasy, lemon squeezy! Using your tofu press, press the tofu for 10-12 minutes. Turning the knobs tighter every few minutes to help squeeze out moisture. 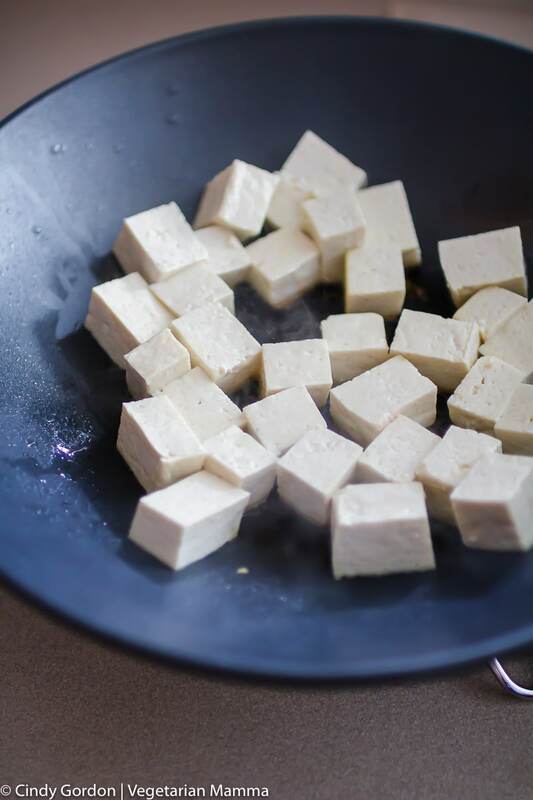 When tofu is finished pressing, cut into cubes and set aside. Heat your wok to 350 degrees F. Add 1 T oil to wok. Add tofu and let cook 45 seconds without touching it. Then gently stir tofu, season with salt and pepper if you wish. Cook until golden brown. Set tofu aside. Add remaining oil to wok. 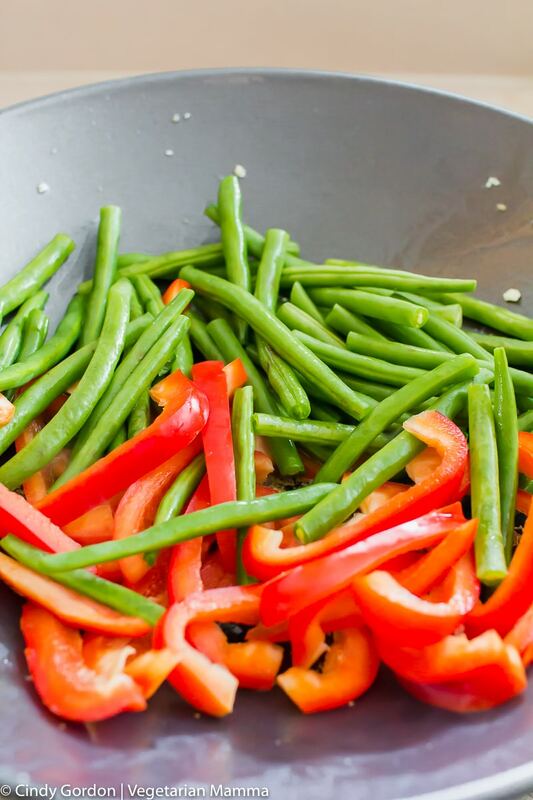 Add green beans and red bell pepper slices. Stir fry for 5 minutes. Add in tofu and cook for another 3 minutes or until veggies are softened. The sauce in this dish can be made a head of time. That cuts your cook time down significantly! This dish works to eat it the day of or using it as a lunch prep for the week’s lunches. I enjoy this dish heated up. This Teriyaki Tofu IS better than restaurant dishes! 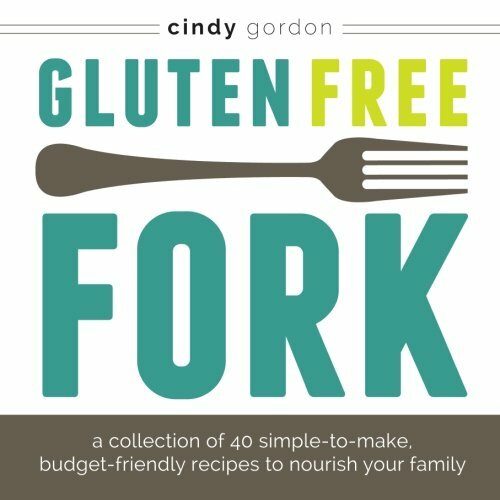 This dish is naturally gluten-free when you use the coconut aminos! You can eat the dish as is or serve over top of rice of quinoa. Is this teriyaki tofu stir fry better than take out? I mean, I probably have a jaded opinion but I say YES! A big YES! Why? Because you know exactly what it in it and you can adjust the seasonings to your liking! Is this teriyaki tofu perfect for week nights? The answer is YES, it is quick and easy! 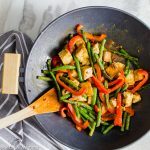 When you do not feel like making a huge meal in the kitchen, this tofu dinner recipe cooks up quick and with minimal mess! 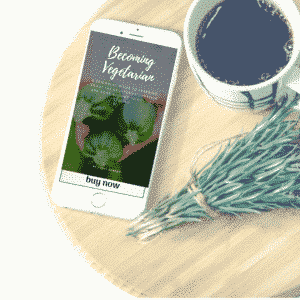 Can I reheat this vegan tofu recipe? Yes, you can use this as a lunch or meal prep. I enjoy this dish reheated! Is this dish gluten free? Yes yes and yes! We used coconut aminos in this dish instead of a soy sauce! We are super addicted to coconut aminos (affiliate ad link) and I think once you try them you’ll be addicted to the taste too! Can you teach me more about tofu? Yes, all types of vegetarians eat tofu. There are several different types of vegetarians. Let’s get cooking with this recipe! I bet you are getting hungry! I know that I am! 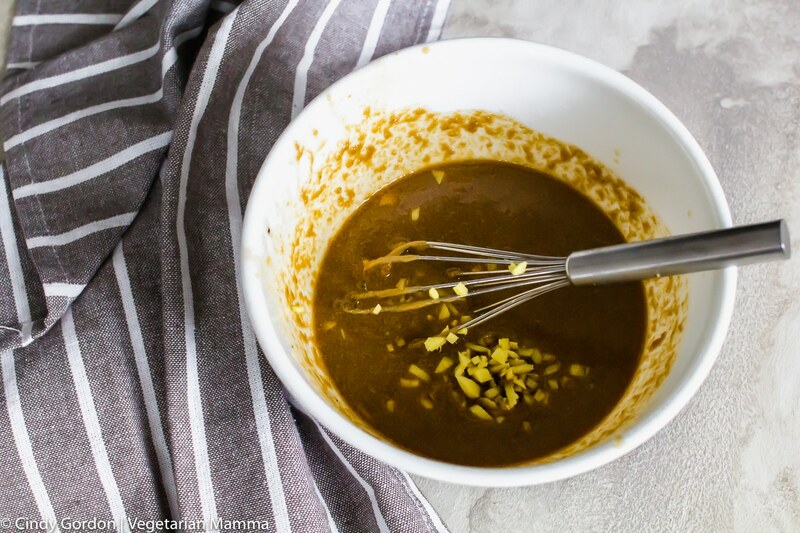 I often add more sauce when I am eating this dish with rice or quinoa as the grains tend to really soak up the sauce! Are you a tofu lover? I’d love to hear your experience with tofu! Drop me a comment below telling me if you love to bake it, stir fry it, pan fry it, grill it or air fry it! Yes, the taste of the coconut aminos is delicious!! This looks delicious! And that tofu press is so cool. I love how quickly it works. It is so cool, isn’t it?! This looks so simple and colorful. But the flavors of added peanut-sriracha sounds amazing. This looks amazing! I think I need to get one of those presses because so far I haven’t been super successful making tofu. Can’t wait to try! I love that little tidbit about Teriyaki’s actual meaning. I thought it was just an ingredient! And that Tofu Press looks essential. You never know if your efforts to get all the water out will be good enough until it’s too late!! 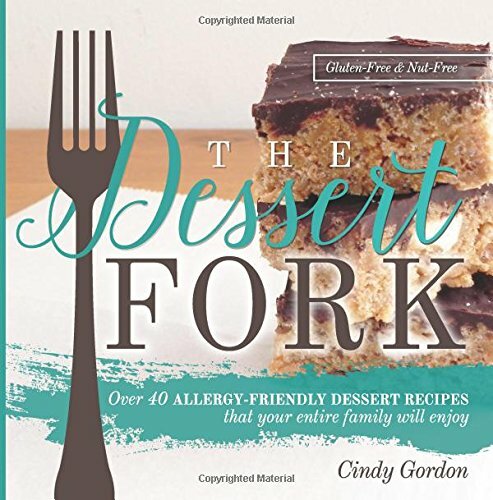 Thanks for stopping by and checking out the recipe!